To celebrate Earth Day, Rep. Keith J. Greiner (R-Upper Leacock) organized a roadway cleanup on Saturday, April 20. More than 60 volunteers participated in the event, which resulted in the removal of litter from more than 20 miles of roads, with more than 55 bags of debris being collected. Greiner is pictured here with Betty Davenport. 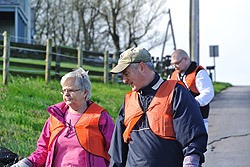 LEOLA – In celebration of Earth Day, Rep. Keith J. Greiner (R-Upper Leacock) was joined by more than 60 people on Saturday morning, April 20, to remove debris from roadways in Upper Leacock Township. During the event, volunteers removed trash from more than 20 miles of roads. In all, more than 55 bags of trash were collected. Greiner noted that along with the people who volunteered, local businesses also contributed to the success of the event. PennDOT provided gloves and orange vests. Glad contributed the trash bags. Dart Container donated cups and trash grabbers. Nestle donated bottled water. Among the groups participating were Cub Scout Pack 54, Boy Scout Troop 54, students from Veritas Academy and five employees from Dart Container. Bronze Star recipient Wilmer R. Gentry also demonstrated his lifetime commitment to service by volunteering. Greiner noted that his event was part of the Great American Cleanup and there are several other upcoming events as part of the campaign to clean up the environment. A list of events can be found at www.RepGreiner.com in the Great American Cleanup link. Greiner also posts information at www.Facebook.com/RepGreiner.